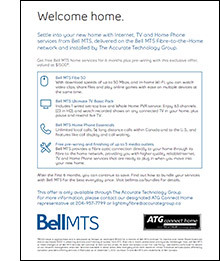 Settle into your new home with Internet, TV and Home Phone services from Bell MTS, delivered on the Bell MTS Fibre-to-the-Home network and installed by The Accurate Technology Group. Get free Bell MTS home services for 6 months plus pre-wiring with this exclusive offer, valued at $1500*. The Accurate Technology Group combines premier brands, a unique shopping environment and a fanatical dedication to customer satisfaction, all in the service of a single-minded goal: To meet and exceed the highest expectations of the most discriminating consumer. In business for more than 25 years, The Accurate Technology Group has won a devoted following among the new home building industry in Manitoba. 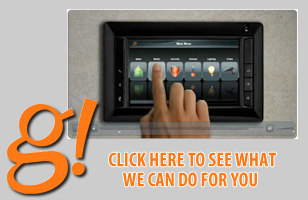 Our demanding customers rely on Accurate's world-class product selection. But what brings them back again and again is the personal attention they consistently receive from some of the most knowledgeable technical design consultants in the business. We believe that a relaxed, familiar, homelike environment is essential to accurately evaluate the merits of the high-end products we see, and that’s why we go to such great lengths to provide it. Our comfortable demonstration room provides the ideal, true-to-life venue in which to compare the performance of different components-so you can be confident in your choices. If you'll accept nothing less than the best, you'll be right at home at Accurate. We're proud to offer the very finest names in home theater, distributed audio and home automation products. If you demand performance without compromise, there's no reason to look elsewhere. Accurate’s Technical Design Consultants are among the most thoroughly and frequently trained in the industry, and they bring their knowledge and passion to bear for the benefit of customers every day. You’ll receive focused, personal attention through every step of the purchase process, from product selection to installation and support. We think it’s the only way to approach a decision this important. An integrated home system is more than a pile of sophisticated equipment. It's all about the experience, and that experience isn't complete until it's fully integrated into your home and lifestyle.